What they are: Tape hair extensions are exactly how it sounds... tape applied to hair. Individual wefts in 2-4 inch sections have a special double sided hair tape applied to them. Then an adhesive is applied and your hair is sandwiched in between each of these tape hair extensions. These are the flattest method there is. Who they are for: Tape hair extensions are for anybody. But they are the best for women who have thin hair as they are the flattest method out there. Type of hair needed: The best tape hair usually comes pre taped. But it can be done with just any weft and tape for the hair. It is sold in 2-4 inch long single pieces. Usually you need 60-80 individual pieces (approx 2 packs) and more if you have thicker hair. Tape hair can be ordered in or you can pick up the hair and tape separately. Installation: Installation time takes about 1 hour to 2 hours. Installation includes 100g of hair or more (about 40+ sandwiched pieces). 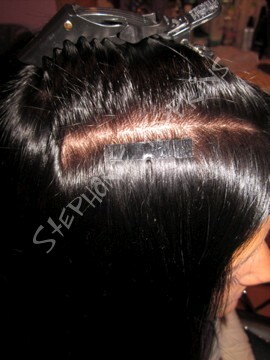 Installation also includes a flatiron and any cutting/blending needed for a natural look. Every installation gets a take home care sheet as well if needed. Cost: $100 for installation. $40 per hour for removal. Cost of hair varies. Hair can be ordered in with the tape preattached $60-$100 for 100g (40 pieces) or picked up separately. The cost depends on the length you want and the quality you want. It is a huge range anywhere from $2-$4 per sandwich. Tape hair can be reused so it is suggested you splurge a little more on the higher end hair. You need to provide tape, if not it is an extra $20 to use mine. Risks: These extensions do not damage your hair. Damage occurs from poor maintenance, styling tools, and excess pulling of the hair. Consistent scratching can create bumps/pimples and/or sores/scabs. You must brush your hair at the scalp. If matting occurs here the extensions should be replaced asap. Side Effects: The tape adhesive is very sticky and can sometime catch loose hairs. This is a short lived side effect until the adhesive breaks down a little bit and brushed out. Headaches are normal the first day and sleep for the first couples days will be uncomfortable until they loosen up. It is suggested you take an advil before your appointment and again before bed. Length they last: On average these extensions last 4-6 weeks until they need to be redone. Tightening is not really possible tightening is a new service because they have to be taken out in order to move them up. The general rule is if you have 2 fingers width of regrowth its time for a tightening! How long they last also depends on how fast your hair grows and how well you take care of them. Hair can be reused if it is taken care of. Maintenance: Use your leave in conditioner and serum everyday! Serum will help reduce tangles dont be shy. Leave in conditioner helps with brushing so you are not snapping hairs that will eventually matt up. Neither of these will break down the tape. You must brush the hair at your scalp, sections are always a good thing. Removal: The adhesive is soaked with a remover and then pulled off. Its a long process as the longer it soaks the better. There will be pulling and the tape that is remaining has to be combed out (its kind of like combing out knots). Remember that everyday we shed naturally 50-100 hairs. When you have a tape hair the hair has no where to go it is caught in the tape. When your extensions are taken out you will lose hair. This is only your natural shed that has already fallen off. It is completely normal. Why you should get them: Because they are the newest popular method. They are undetectable if blended properly. They lie extremely flat to the head. They can add highlights or lowlights instantly. They add beautiful lengths and volume. They are reusable.